Anybody who lives in the UK will know that this summer (if you can call it that), it rained pretty much constantly. Spring seemed to just turn into autumn, with only a couple of warm sunny days in between. 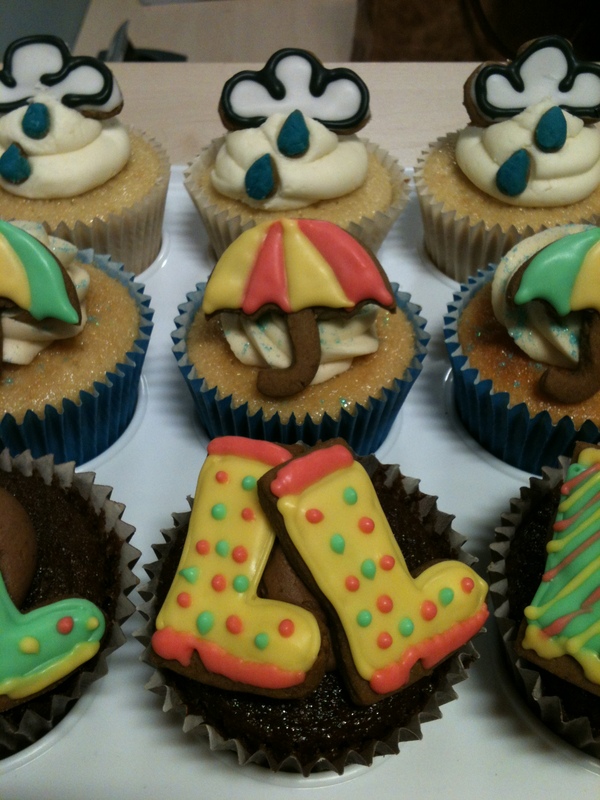 The bad weather is what inspired these cupcakes, so I guess something good came out of the bad weather. A friend in the office, Faye, left to go on secondment to Australia, just over a year ago. I had come up with some really cool Australian themed ideas for cupcakes so I asked if I could make some “leaving” cupcakes for her… and that’s when the whole making cupcakes everytime somebody left the office started. Having made some Aussie cupcakes for her when she left, I then said that I would make some British themed ones when she returned. 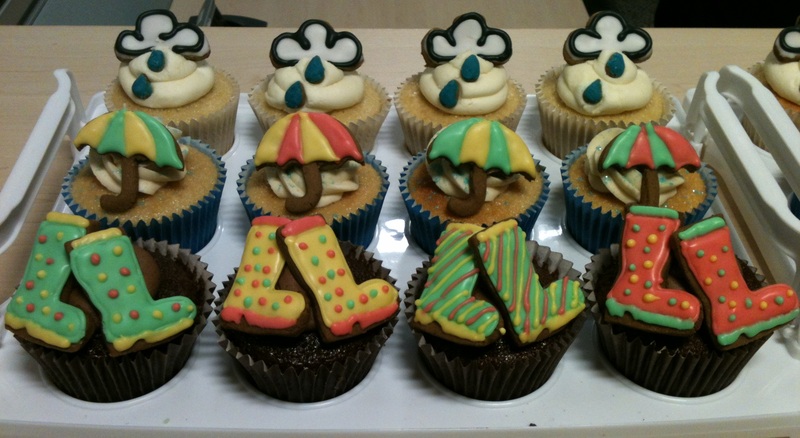 So when she popped into the office for a visit this summer I took the opportunity to make some cupcakes! The biscuits on top of the cakes are my made up gingerbread recipe – hopefully I’ll get around to adding it to the blog soon! I didn’t have small enough cookie cutters so I just cut them out by hand with a knife (using a piece of paper for each of the shapes as a template). If you want to learn how to ice biscuits, click here. Line 2 muffin trays with 18 cases. Pre-heat the oven to gas mark 5. Beat the milk, eggs, vanilla and caramel together in a jug and then gradually beat into the dry ingredients until smooth (ensuring that you scrape down the sides of the bowl after each addition). Divide the mixture evenly between the 18 cases (or as many as you get filling them 2/3rds full) and then bake in the oven for 18-20 minutes until they are lightly browned on top and spring back when pressed (and a skewer comes out clean). I usually check them and turn them around after 15 minutes. Beat the icing sugar and butter together on a very slow speed until the mixture resembles coarse breadcrumbs. I always put a tea towel over the top of my KitchenAid to prevent icing sugar going everywhere! Then slowly add the milk and vanilla. Once it’s all been added increase the speed and beat on high for 5 minutes until light and fluffy. Finally add the caramel and beat in well. Please note that this is meant to make enough for one batch of cupcakes i.e. 12-16 but I find it makes way too much! I actually halve it and still end up with plenty to ice a whole batch of cupcakes! They are so pretty! You lie, though. There were no warm days. None. Also, I don’t remember being offered any of these cupcakes, Emma. I’m sure the temperature reached double figures once? Or maybe that was a dream. Tom brought me back a giant Toblerone so I’ll let you have one, or maybe two, of the cupcakes I make with it next week to make up for you not having one of these.